A Power of Attorney is a formal document giving another person the authority to make personal and financial decisions on your behalf. Making someone a Power of Attorney or Enduring Power of Attorney can be a involved and complicated process. If you need help in this area, George Lawyers can take you through the whole process and explain things in plain English so you can better understand what’s required – because, we know it can all be a little bit confusing at times. 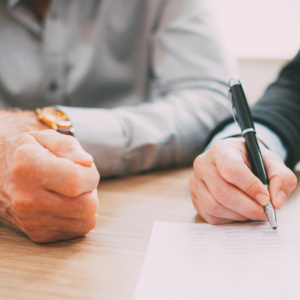 General Power of Attorney is a formal document giving someone the legal authority to act alongside or on your behalf; including private affairs, business or other legal matters. People usually make others general non-enduring powers of attorney, because they are unavailable or want assistance to manage their financial affairs. General non-enduring powers of attorney are often used for a specific purpose and for a fixed period of time. For example, when someone needs another person to run their business while they are overseas. A general non-enduring power of attorney is not for future planning. If the person who made the power at a future point in time does not have decisions making capacity for the relevant financial matters, a general non-enduring power of attorney does not operate. And the attorney cannot make decisions during this time. An Enduring Power of Attorney is used when you are legally incapable of conducting your own affairs – financial or property, personal or lifestyle. When a person has not given Enduring Power of Attorney to another and that person loses legal capacity, the law provides a process (via the Adult Guardianship rules) for another person to apply to manage that person's financial affairs and property. We can assist you or direct you accordingly. The power ‘endures’. This means that person who has Enduring Power of Attorney continues with their role, even when the person loses capacity to make their own decisions about matters. The attorney’s decisions have the same legal force as if the person who appointed them had made them.